Yale University students and faculty rally to demand that Yale become more inclusive to all students on Cross Campus in New Haven, Conn. As debates about race and other social issues flare on campuses, college presidents in recent weeks have taken steps to assert the importance of the free expression of ideas. 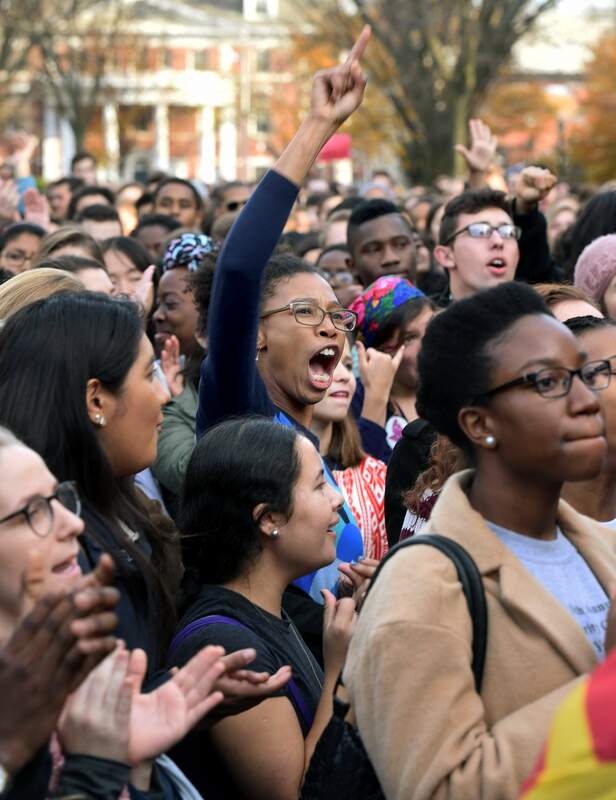 HARTFORD, Conn. – As debates about race and other social issues flare on campuses, college presidents are increasingly intervening to draw a line when cultural sensitivity conflicts with freedom of speech. At schools including Yale, Williams College and Wesleyan University, leaders have in recent weeks taken steps to assert the importance of the free expression of ideas, even those that some might find objectionable. School presidents reject critics’ portrayals of today’s college students as coddled and overprotected, but some say students arrive in need of help learning to engage others with contrary opinions. In their responses to barriers that go up around some discussions, they say they strive to keep conversations going, often reminding students that a commitment to free speech is part of building an inclusive campus. At Williams, a liberal arts school in western Massachusetts, President Adam Falk expressed frustration when a student group last month canceled a speaking invitation for writer Suzanne Venker, a critic of feminism. Picking up on a theme from a convocation address earlier in the semester, he wrote to the campus community that learning cannot occur without exposure to a wide range of ideas. A recent wave of campus protests nationwide has brought new attention to the issue, with some civil liberties advocates fretting that it will erode free speech. The protests, including those that led to the ouster of the University of Missouri’s president, also have added to the pressure on presidents to be responsive to students’ demands. But institution leaders say it is nothing new for them to navigate First Amendment conflicts, with more cropping up with this generation in particular on campuses that are generally far more diverse than their communities at home. Wesleyan’s president, Michael Roth, wrote a piece defending free speech in September after the student government moved to cut funding for the student newspaper over an op-ed piece on the Black Lives Matter movement. In an interview, he said the fact that some do not value free speech above all things is not a sign of a problem, but rather reflects one of many continuing debates on a diverse campus. Still, Roth said he was asked this week by students how he could defend both the student newspaper and students protesting racism. A similar debate has played out at Brown University, where President Christina Paxson criticized the student newspaper over columns that the editors themselves deemed racist after they were published. While some faculty members said the administration’s actions suggested it wants student editors to suppress all opinion pieces that could be deemed offensive, others have argued that calling out racism does not encroach upon freedom of speech. Falk said all college presidents are seeking the best strategies to keep people on campus engaging with each other productively. “Any gathering of college presidents, no matter what the topic, turns into a conversation about these issues,” he said.